Add another moon to the New Horizons photo gallery: the spacecraft’s Long Range Reconnaissance Imager detected Triton, the largest of Neptune’s 13 known moons, during the annual spacecraft checkout last fall. New Horizons was 2.33 billion miles (3.75 billion kilometers) from Neptune on Oct. 16, when LORRI, following a programmed sequence of commands, locked onto the planet and snapped away. 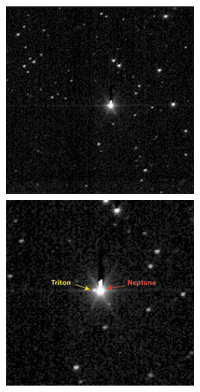 “We wanted to test LORRI’s ability to measure a faint object near a much brighter one using a special tracking mode,” says New Horizons Project Scientist Hal Weaver, of the Johns Hopkins University Applied Physics Laboratory, “and the Neptune-Triton pair perfectly fit the bill.” LORRI was operated in 4-by-4 format (the original pixels are binned in groups of 16), and the spacecraft was put into a special tracking mode to allow for longer exposure times. “We needed to achieve the highest possible sensitivity,” Weaver adds. Mission scientists also wanted to measure Triton itself. “Among the objects visited by spacecraft so far, Triton is by far the best analog of Pluto,” says New Horizons Principal Investigator Alan Stern. The Voyager 2 spacecraft took spectacular images of Triton during its flyby of Neptune in 1989, showing evidence of cryovolcanic activity and cantaloupe-like terrain. Triton is only slightly larger than Pluto (1,700 miles [2,700 kilometers] in diameter compared to Pluto’s 1,500 miles [2,400 kilometers]). Both objects have atmospheres primarily composed of nitrogen gas with a surface pressure only 1/70,000th of Earth’s, and comparably cold surface temperatures (-390° F on Triton and -370° F on Pluto). Triton is widely believed to have once been a member of the Kuiper Belt (as Pluto still is) that was captured into orbit around Neptune, probably during a collision early in the solar system’s history. New Horizons can observe Neptune and Triton at solar phase angles (the Sun-object-spacecraft angle) that are not possible to achieve from Earth-based facilities, and this unique perspective can provide insight into the properties of Triton’s surface and Neptune’s atmosphere. LORRI will continue to observe the Neptune-Triton pair during annual checkouts until the Pluto encounter in 2015. New Horizons is currently in electronic hibernation, 1.2 billion miles (1.93 billion kilometers) from home, speeding away from the Sun at 38,520 miles (61,991 kilometers) per hour. What other moons has New Horizons photographed? Check out the collection from the 2007 Jupiter flyby. The top frame is a composite, full-frame (0.29° by 0.29°) LORRI image of Neptune taken Oct. 16, 2008, using an exposure time of 10 seconds and 4-by-4 pixel re-binning to achieve its highest possible sensitivity. 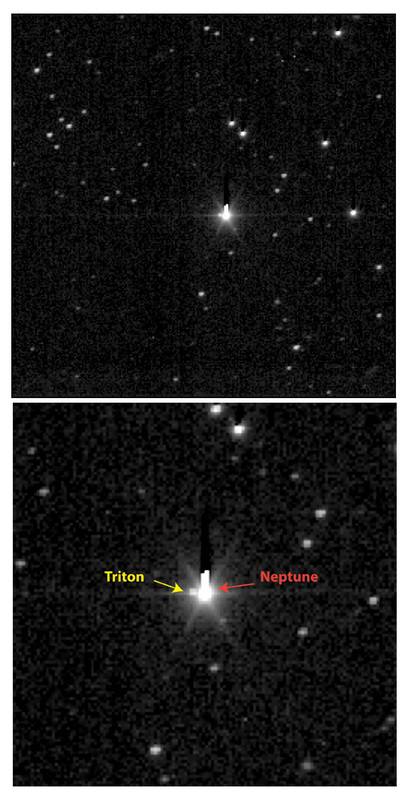 The bottom frame is a twice-magnified view that more clearly shows the detection of Triton, Neptune’s largest moon. Neptune is the brightest object in the field and is saturated (on purpose) in this long exposure. Triton, which is about 16 arcsec east (celestial north is up, east is to the left) of Neptune, is approximately 180 times fainter. Scientists consider Triton to be one of the best analogs of Pluto in the solar system. All the other objects in the image are background field stars. The dark “tails” on the brightest objects are artifacts of the LORRI charge-coupled device (CCD); the effect is small but easily seen in this logarithmic intensity stretch. The original image was taken to test New Horizons’ optical navigation capabilities.